If you use a cleansing brush to wash your face with, you'll enjoy the deeper cleansing that they provide, being able to remove dirt, grime and makeup residue better than manual hand wash can. But after a period of time, the brush heads themselves gets quite dirty with the makeup residue (even after removing makeup before using the brush) and becomes grimy. 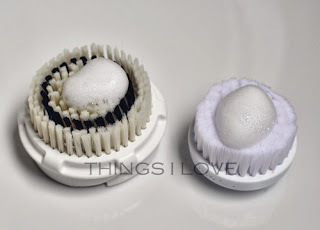 Like makeup brushes, it's important to keep the brush heads cleans so that you don't have bacteria sitting on it and introducing it onto your skin when you go to use it. You can clean your makeup brushes using the face wash itself but I find that wasteful and not the most effective as these cleansers are made to be gentle on skin. Instead I find foaming hand washes and makeup removers are the most effective brush cleansers. This makeup remover is great to use only only on your face but also if the bristles of your facial brush are starting to look more brown than white. Makeup removers have the ability to take away the residues of waterproof makeup and this foam based one makes its easier to disperse and work into the bristles to quickly remove the grease and makeup build-up so the brushes look clean and white again. This handy softening foam hand wash is strong at killing nasties but gentle on hands and with a sweet cherry blossom scent. 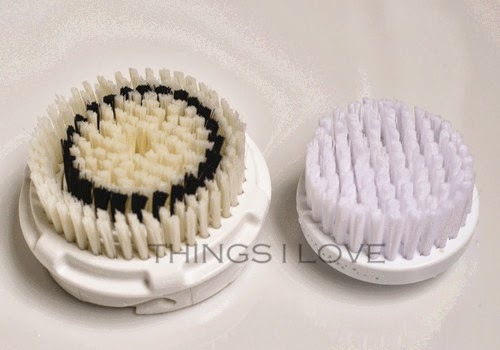 Use this on your brush heads for clean, fresh bacteria-free bristles, eliminating the chance of spreading any germs back onto your face. The large pump means it's easy to dispense the right amount of airy foam for use as a hand wash or a brush cleanser and I've used it to wash a few of my eye makeup brushes as well. Dove Foaming Makeup Remover and Dettol Touch of Foam handwash are available at supermarkets, leading pharmacies and Priceline. Did Gillette Fusion ProGlide Power make the Boyfriend shave more often? When it comes to men's grooming - most men like to keep it simple. And when it comes to shaving, most guys will just grab the closest disposable blade and think it will do the job. Case in point: the boyfriend who gets a 5 O'clock shadow only shaves twice a week - once midweek so it he maintains some decency for work and then again on the weekend when I see him and complain that his facial hair is too prickly for me to go near his face. Apparently I'm not alone in the loathing of scraggy stubble look as over 50% of women in Australia* also regularly make this complaint and avoid kissing their partner as the prickly stubble irritates them. Now the excuse from the boyfriend for not shaving more frequently is that his skin becomes sensitive and raw due to the razor blade scraping against it, causing him irritations. So when I was offered some Gillette sensitive shaving products to review, I was only too happy pass it over to him in my attempt to encourage more regular shaving. Now the boyfriend was previously using his Gillette Mach3 razor and hydrating shaving gel so he was skeptical that he new goodies he got would make much of an improvement. I'm glad to say that he was happily wrong when he tried out the Fusion ProGlide Power razor. Gillette Fusion ProGlide Power is the latest technological disposable razor offering from Gillette that was released last year. The thinner 5 blade is meant to cut more hair in one scrape, giving a closer shave around the contours of the face and an improvement to its predecessor the Mach3, but the boy doesn't feel there was a big enough difference to make him rush out and buy into the hype of 5 blades. He did say that the fusion Proglide blade retains its sharpness better than any other blades he's used, even after 4 weeks of use so for those who don't change their razors regularly, this would be a better (and cheaper in the long run) option. He also liked the ergonomically designed battery powered base which creates vibrations during use that helps the razor glide through his skin with less tug, meaning less irritations and rawness. 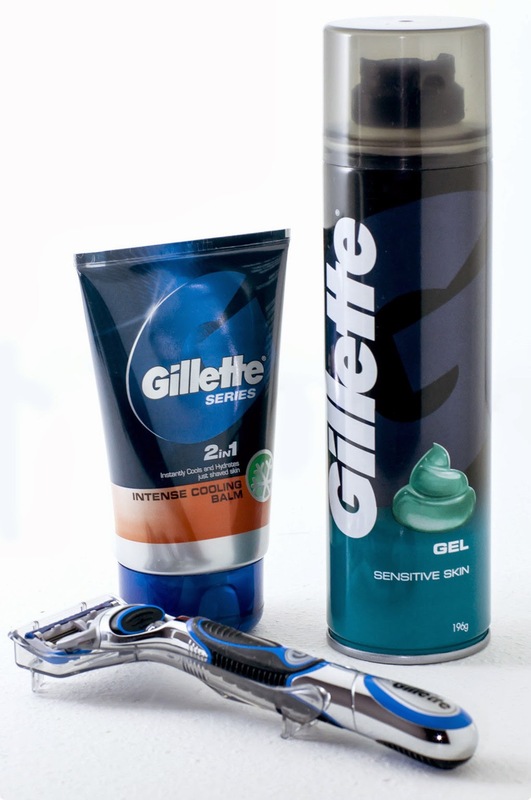 The Gillette Sensitive Skin Shaving Gel which turns into foam upon dispensing helped to soften his skin and facial hair enough to help give a comfortable shave and helps prevent redness and tightness of Skin. The boy already alternates between the hydrating and the sensitive skin variety (according to him, there was no difference in use). His favourite new product to his shaving regime was the Gillette Intense Cooling Balm. The aloe based balm with its quick cooling and calming properties helps to soothe and restore moisture as well as reduce some of the rawness of just shaven skin. The only downside is the scent is too overwhelming and slightly too pine-fresh for ones liking, especially for sensitive skin types as it can conjures up images of household cleaning products with the same scent. That aside, the balm is like a moisturiser for irritated skin that just helps restore the skin barrier function after its been scraped off by the razor. So after all his new grooming products to try, did I succeed in getting my boyfriend to shave more regularly? I'm sad to say only marginally. We've come to an agreement where he shaves on days we see each other to save me the prickly stubble feel whenever I'm close to him and and he can have his scraggly facial hair at other times. Win-win I say. What about you? do you prefer a clean shaven face or you don't' mind some facial hair? Fusion ProGlide Power razor RRP A$16.99, Sensitive/Hydrating shaving gel 196ml RRP A$6.20, Intense Cooling Balm RRP 100ml A$11.99. Gillette products are available at supermarkets, pharmacies and Pricelines stores. *Stats provided by P&G's Gillette 2013 study on a sample size of over 1,000 Australian women aged 18-39. Makeup is an expression of ourselves whether we use it to subtly enhance our natural features or theatrically transform our looks. But most of all, it's meant to be fun. Now makeup can range from being relatively cheap where a couple of dollar will be buy you a lip gloss or eye shadow to the eye-watering prices from prestige brands that would set you back a small fortune. Obviously marketing and packaging is a factor in the price differential but as the old adage goes, you get what you pay for and quality is definitely a big reason why there is such a price difference. However, the quality difference between high-end and what drugstore/chemist brandz is closing in today's competitive beauty market. 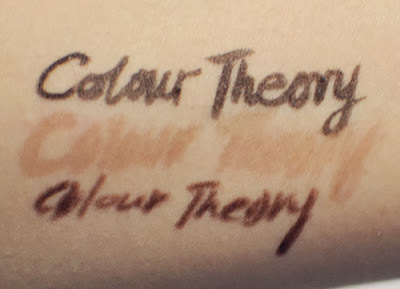 One such brand that have recently launched in the Australian drugstore market last month is Colour Theory. I've had the opportunity to play around with a few of the offering to see first hand what they are like. The quint eyeshadow palette looks amazing, the colours in the "All Eye Need" is a well matched neutral brown family with 4 metallic shades ranging from pale champagne, silvery lavender, brown copper, cool brown to matte dark brown housed in a sturdy clear plastic case. Using the sponge applicators provided, I had no problem picking up the colour to swatch or use on my eyes but for some reason, it was hard to pack the product onto makeup brushes during application and many rounds of picking up the colour was required to achieved the desired level of colour payoff. The texture of these shadows are also a bit chalky but was easy to blend and you do achieve the colour on the pan after some persistent application. There was hardly any colour payoff from the matte dark brown shade (It was very hard to pick up by finger, sponge or brush) so would be suitable for use to do crease work only and not to line eyes. I'm not sure whether the other palettes have similar problems or it's this particular shade that cause the formula to be harder to work with. 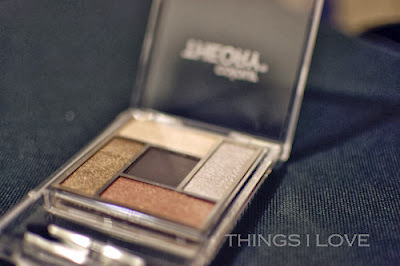 Surprisingly, these shadow have incredible lasting powers on my oily eye lids, staying in place for more than 4 hours with very minimal fading or smudging. Perhaps its budge-proofness during application meant that it also didn't budge on skin afterwards, fairing better than a lot of its pricier competitors. I've never used a liquid brow pencil before so found this light colours pen very easily to use to fill sparse brows and give it shape and definition. The fine felt tip means more precise lines can be drawn to create the perfect brow. My only wish is that they made a darker shade that would suit my black brows more. The black liquid eyeliner is smooth to apply with its fine tip to give neat lines, and once set was able to last 4 hours before starting to fade to give a very sultry line. My only disappointment is that the colour is not jet black enough but rather a dark grey shade. Once set, was budge proof on my arm but on watery eyes, do get a bit of smudging - something that all pencil eye liners are prone to but is great for creating a smokey eye look. I've created a neutral smokey eye look using the products from Colour Theory and thinks the results look amazingly pretty. I would use the eye products, even the difficult-to-apply shadow palette when I have a bit more time to do my eye makeup (perhaps it's a sign I need to invest in a pack of sponge eye applicators)! 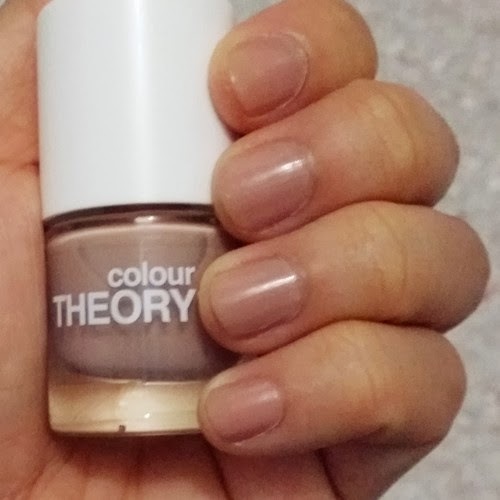 By far my favourite product is the nail polish - it goes on evenly and provides high glossy coverage that is easy to apply and non streaky, the shade Mochachino is the perfect beige colour on warm skin tones that makes nails looks sophisticated and chic. 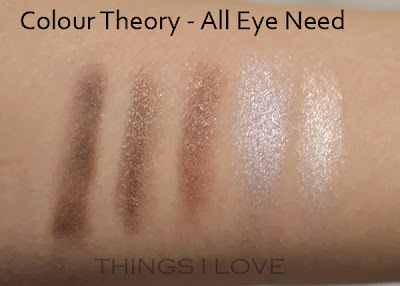 Colour Theory cosmetics offers so many different products and universally flattering colour at such good prices, it's hard to go past them without giving them a try. They are great for those starting out with makeup and want to experiment with different colours as well as for a little pick me up when you don't want to spend a lot of buy something for yourself. Colour Theory is available now at all Amcal, Amcal Max and Guardian Pharmacies across Australia. Have you tried Colour Theory? What are your thoughts on this new range? It's been a couple of weeks since my last update and I've been a busy bee. I've filed 4 tax returns for the family (with still another 3 to go ><), almost bought a property, finalised the mortgage of and sold a property (for deceased estate) and got through the presentation and evaluation process with a tender at work. It's been such a stressful month in October that it's my neck, shoulders and arm started to play up with constant pain over the past few weeks. Anyhow, things are looking a bit brighter now and it's only 4.5 weeks until I'm off to Asia for a much needed break in Taiwan, Hong Kong and Japan. Yes I'm getting just a tad excited now. And even though I've not had the time to write as frequently as I like, I've been using a few new products lately and this one I'm reviewing today had me so impressed with its efficacy, I wished I had found out about it years earlier - particularly during my teens. The reason this home grown product piqued my interest was when I read about it on a forum a while back about how it does amazing job of controlling blackheads. Since blackheads are a 'permanent' fixture on my nose, I decided to give the product a go and see if it would remove this 'unwanted' guests. With 25% glycolic acid in a buffered solution, it acts as an intense night exfoliating treatment to accelerate the removal of top layer dead skin cells and unclog any blocked pores. It also helps to fade any superficial marks and discolourations from blemishes and helps reduce the appearance of fine lines. It also contains lactokine (milk protein) and aloe vera extract to help reduce skin inflammation and perfect for speeding up healing of blemishes. 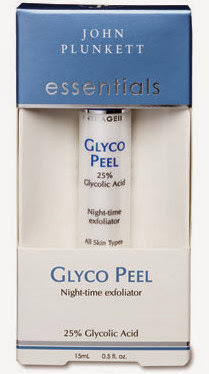 Glyco Peel is a clear watery liquid that I use on freshly cleansed skin at night. I spread a very thin layer over my nose, cheeks and chin (basically the T-zones where I'm prone to blackheads and congestion on the skin). I have fairly tolerant skin but this product can still cause a slight stinging sensation as the product is absorbed, especially when you have any broken skin from popping a whitehead but as long as you are able to tolerate the sting, it was fine to use (even though it's marketed for all skin types, if you have sensitive skin or can't tolerate stinging sensations, I suggest doing a patch test or washing the product off if it stings too much). I wait for the liquid to dry on my skin which take only a minute or two and then proceed to apply other skincare (usually a whitening serum, and a night moisturiser) which also helps to calm down the sting cause by the Glyco Peel. 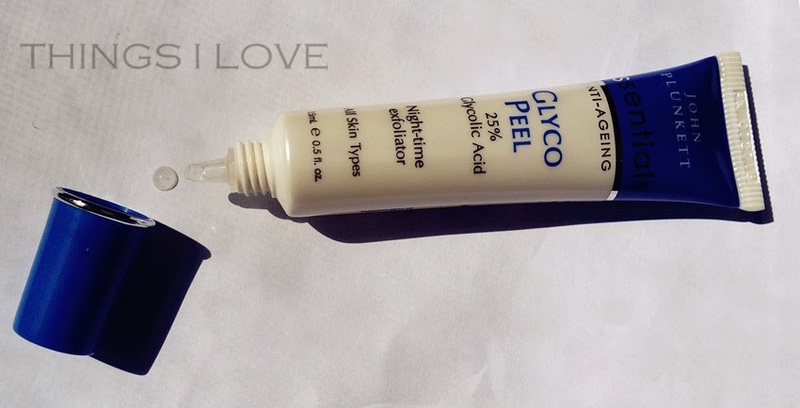 The word peel in its name is deceptive as it doesn't cause the skin to peel, which was good news to me as I wouldn't use the product if it caused visible flaky skin. Within a day's use, my skin is less oily. After 3 night's of use, I see that the pores on my cheeks are reduced and refined. I also noticed that underlying blemishes under the skin and congestions are calming down and disappearing. The blackheads on my nose take the longest to see results with over a week's use before I notice fewer black dots on my nose and they were easily dislodged during a scrub in the showers. 2 weeks later, I almost have a clear nose again. As for fine line reduction claim, I've not noticed this in the 3 weeks I've used the product so won't say it meets this claim, unless it's delivered after long term usage but my skin is softer and smoother with its use along with other skincare products. I'm rapted with the results of the product and now use it every night when I'm having a bad skin week or every second night to just help control my sebum levels. I still experience the slight tingly/stinging initial sensations, but it doesn't cause my skin to flare up so I continue to use it as I think I've finally found a winning product in combating pore and blackhead problems. Just keep in mind that glycolic acid is an AHA so will cause photo-sensitivity so be sure to slap on the sunscreen during the day to keep the new skin protected from sun damage. John Plunkett Glycol Peel 15ml - RRP A$28.95 at selected pharmacies and online at Plunkett Pharmaceuticals.